The Checkout Field Editor provides an interface to add, edit and remove fields shown on your WooCommerce checkout page. Go to: WooCommerce > Checkout Fields. Name – Name of field, which is used as the meta key to save info. Must be unique. Type – Field type. See ‘Types’ below. Label – Label for input shown in checkout. An options list starting with a pipe creates an empty choice. Used in conjunction with a required select field, it will force the user to choose a valid option. An options list without a pipe as first character will make the first option in the list the default choice whether the field is required or not. Position – Left, right or full width. This applies CSS styling to the box. Validation rules – Choose validation rules to apply: Email, number, and required are supported. Text – standard text input. Password – password text input. Textarea – A textarea field. Select – A dropdown/select box. Requires options set. Multi-select – A multi-select box. Requires options set. Radio – A set of radio inputs. Requires options set. Checkbox – A checkbox field. Heading – Adds a heading to allow separating fields into groups. 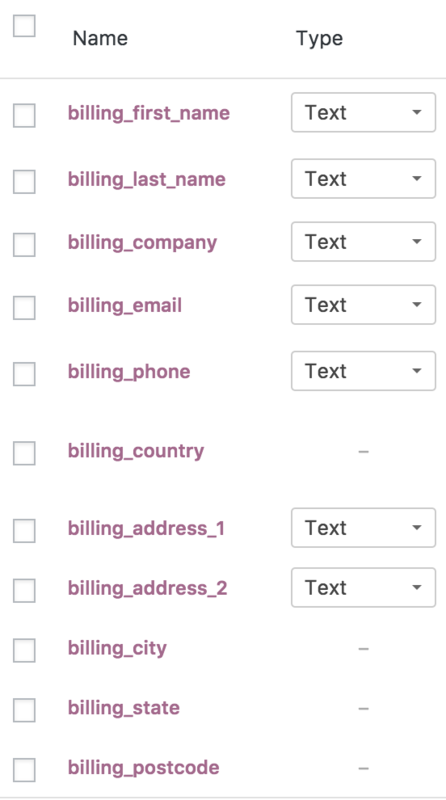 In the Billing and Shipping sections, there are core fields highlighted in purple. Note: Disabling or modifying core fields can cause unexpected results with some plugins; we recommend against whenever possible. Fields that change dynamically based on the chosen country of a user (address 1, address 2, city, state, postcode) cannot have custom validation rules, e.g. 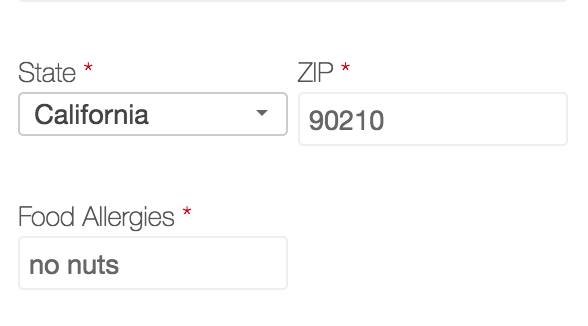 Required fields are determined by locale, not by your settings. Change the labels and position of the fields. Disable them by ticking the checkboxes per-row and clicking the ‘Disable/Remove’ button. Disabled fields are then greyed out. Use at your own risk. Re-enable core fields by checking the rows and pressing the ‘enable’ button. 1. Select the Add Field button. Once a field is added, a blank row appears. 2. Enter your text and preferences. Go to: WooCommerce > Status > Tools. Scroll down to Checkout Fields. Select the Reset Checkout Fields button. Any customizations to your fields will be removed. This is definitely possible and outlined in its own doc on how to use the custom field you’ve created. This adjusts the year selector of the date picker to expand by 40 years. You can add placeholder text when using the Select field by adding 2 || to separate the placeholder from the option values.